You may substitute half and half for the cream. Use high quality bacon that is very lean. Remove large sections that are pure fat. It’s not necessary in this variation on a carbonara theme. This recipe is pretty seriously garlicky. If you are not so much of a fan, reduce the garlic by 1 or 2 teaspoons. If you are a salter – add a little, but remember the bacon has sodium, so don’t get ridiculous about it. This sort of dinner is fast and very flexible. If you have mushrooms, slice them up and cook them with the bacon. Delicious! This is NOT the traditional Carbonara you will find if you go to Italy. For the real deal I suggest you get my friend Benny the Chef’s wonderful book: The Art of Cooking According to Me. Then you can learn to cook in the Roman style! In a medium sized bowl, mix together the peas, cheese, eggs, cream, garlic, oregano, and black pepper. Set the bowl in the refrigerator while you prep the rest. This step is especially important if you have a counter jumping Grandcat. Slice the bacon to 1 inch chunks. Brown in a skillet over medium heat with the onion and olive oil. The bacon should not crisp, just start to brown. Meanwhile, boil salted water for the pasta. Add the spaghetti when the water is boiling and cook per package directions. When the pasta is about halfway done, scoop out a ladle of water and add it to the bacon mixture, raise the heat to medium and let simmer while the pasta finishes boiling. Reserve another large ladle of pasta water in a small bowl or Pyrex measuring cup. Drain the cooked pasta and return it to the cookery pot. Mix the bacon-water into the pasta, then quickly stir in the peas and egg mixture. Stir fast and the eggs will incorporate into the sauce instead of turning into recognizable chunks of egg. If the mix looks dry, it means you were heavy handed with the cheese. Tasty, and I hope mindfully done, but not the best for a sauce. Correct for this by adding some of the reserved pasta water until the texture is nice and creamy. Gently mix in the parsley or at the table along with a bit more cheese. Serve with a large leafy green salad and if carbs are not to be counted, perhaps a slice of garlicky bread. 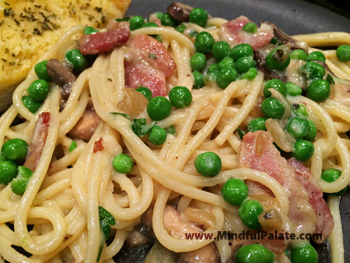 This entry was posted in Italian-American, Main Dish and tagged bacon, carbonara, cream, easy, fast, peas. Bookmark the permalink.